There are hundreds of luxury hotels in Dubai, and almost all have one thing in common - they’re all housed in the tall modern buildings that the city of famous for. They are usually spectacular, with over the top amenities and opulence. So in a city full of luxury hotels, how do you find one that stands out, feels different, yet still has the same comforts we’ve grown to love from Dubai. Well there is a hotel that retains all the latest comforts available in the more contemporary hotels, yet brings you back to an exotic time when people lived in Palaces. The Palace Downtown Dubai looks like something straight out of Aladdin, and allows you to feel like an Emir during your stay all while being in the heart of modern and bustling Dubai's Financial District. To get this experience you don't have to trek out to some distant part of the city, in fact the Palace occupies one of the most prime locations in Dubai. It actually physically connected to the Dubai Mall, with the Burj Khalifa and the famous fountains both a stone's throw away. It is certainly a contrast to see these ultra-modern skyscrapers tower over the antique arches and walkways of the palace, but the juxtaposition gives the place all the more atmosphere – and convenience. Upon arriving at The Palace Hotel, Dubai we drove through a medieval style archway gate, passing walls and towers topped with battlements, and then up the palm tree lined driveway. Stepping inside the lobby we found ourselves in a light open space with rugs, hanging lanterns, more arches and a fountain topped with red flower petals and candles. The Palace is definitely a fitting name for this hotel and the beauty of the entrance made it my favorite part of the hotel. Our room gave us spectacular views of the lake and Burj Square beyond. In the evenings we would sit on the balcony and take it all in – even being treated to the famous fountain show in the distance. Despite being one of the smaller rooms the hotel offers, it was spacious enough for our needs and very comfortable. The hotel provided a crib for Axel, and really went out of their way to make us all feel at home. One of the attendants overheard us saying that it was Axel's four month birthday during our stay, and next thing we knew they were bringing us a cake for him and some sparkling cider for us! It was a lovely gesture which made our stay all the more special. The room itself was decorated in the same opulent style as the rest of the hotel. Think dark brown wood, ottoman stools and wooden divider screens intricately carved with Islamic patterns. It balanced old and new perfectly, with crisp white sheets and carpets making it feel as up to date as it did traditional. The hotel's website boasts that you can 'dine like royalty', and this is a statement that we are certainly not going to dispute! The two lounges offer light bites, as does the hotel bar, and the Al Bayt lounge even offers a high tea, with one version local cuisine based on English traditions and one using local dishes. Both will certainly make you feel royal, but it's up to you if you want to be an emir or a member of the British aristocracy! There are three restaurants within the hotel, each offering dishes from a different part of the world, and the Address Group (of which The Palace is a part) has several other hotels within walking distance each with their own set of restaurants you can visit. For us, there was one that stood out over the others, dinner at Asado. Taking its inspiration from Argentina, it is a carnivore's dream. While neither Chris or I are huge meat eaters, the quality of the food, service, and atmosphere made us extremely happy that we visited. At Asado, you can dine out on the patio right on the edge of Dubai Lake, and and take in an almost unobstructed view of the nightly fountain show. They faithfully recreate the parilla experience so make sure you order something from that section of the menu. Don't miss the provoleta either – this may be one of the best versions of the baked provolone dish, that we’ve had. The heat of Dubai can leave visitors feeling in need of some relief, and a spa fits the bill perfectly. At The Palace you can cool off in the oriental bath houses or the outdoor pool. You can also recharge in the relaxation center, use the steam room or have one of their many massages. We both went for a massage, and came out relaxed and invigorated. The therapists were able to assess our wants and match that with what our bodies needed to feel relaxed and restored. If you prefer more active pursuits, there is a fully equipped fitness center complete with personal trainers. There is also a business center which incorporates computer stations, a library and even a free DVD rental service. One of the best amenities is the digital service system they have set up. From the iPad in your room you can order room service and housekeeping, watch TV or one of their movies, make reservations at their restaurants and spa and even buy tickets to Dubai's main attractions. All this is all without even having to get up. Many of Dubai’s main attractions are just outside the hotel's doors. Downtown Dubai is basically one large complex and The Palace sits right in the middle. 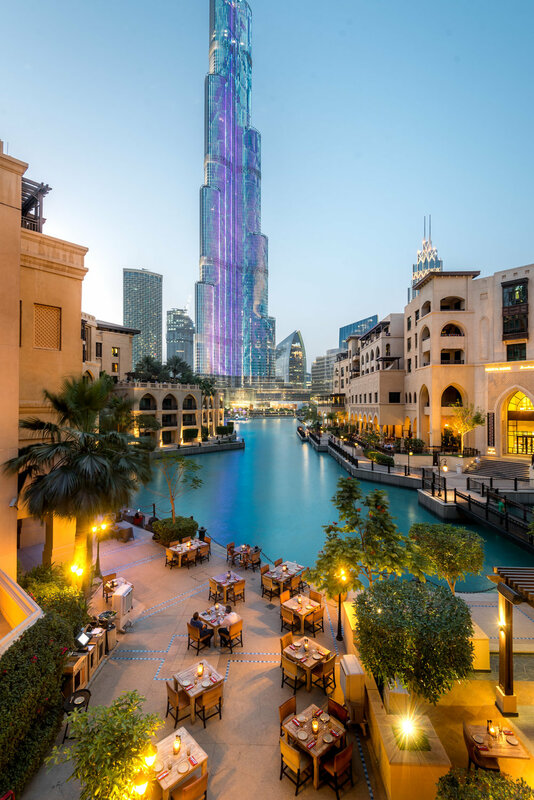 Without even having to cross a road you can ascend the Burj Khalifa, admire the Dubai Fountains and visit the Dubai Mall – home to the ice rink, aquarium and zoo, as well as countless shops and cafes. Anyone visiting Dubai will be more than satisfied with a stay at The Palace Downtown, Dubai. It's location means that couples, friends or business travelers will find it as convenient as it is luxurious. We can also say with first-hand experience that they go out their way to make families feel welcome. There is no area were The Palace fails to meet its own high standards, and thanks to the quality and food options, this is where they really excel.